Over the last few months M and M started recording videos on their tablet. They were having so much fun with the video maker I thought it was the perfect time to introduce them to stop motion for kids! I was right. We’ve been having a blast learning new stop motion techniques and learning tips to make these simple videos even better. As I started searching techniques and tips, I quickly realized that learning stop motion could easily become a long term process. We started very simply and I’ve added activities a little bit at a time. Play with light. Lighting plays a big part in stop motion. If you are using natural light (like we have done) you need to be somewhere that the light will stay consistent for a while. Try out different spots in your house to see what works best for you. This video on lighting tips for stop motion does a good job of explaining how to use artificial lighting without spending a lot of money. Create a background and add props. Create an entire scene by trying out different backdrops. Use sheets or pillowcases, poster board or draw out a background. Find (or make) props to add into the video. Disappearing objects. Watch this video of disappearing (and reappearing) daffodils. Pull together a collection of items. 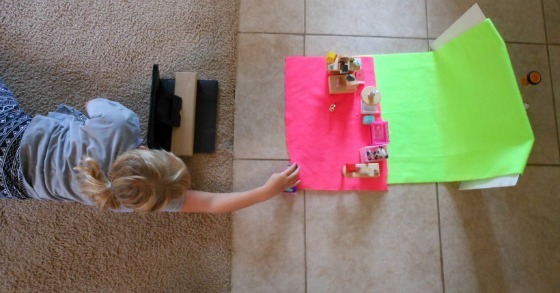 Create a video where the items fill the space… and then disappear one at a time. Little details. With stop motion, the more attention you pay to the details the more realistic the video will look. Watch this video about objects sliding, then create a sliding video of your own. The best thing about stop motion is that all you need to get started is a tablet or a smartphone. When you’re ready to invest a bit, these are some great tools. This section of the post contains affiliate links. Tablet. We like our Samsung Galaxy Tablet. Tripod. The kids are currently using blocks to prop up their tablets. This flexible leg tripod is at the top of our wish list. 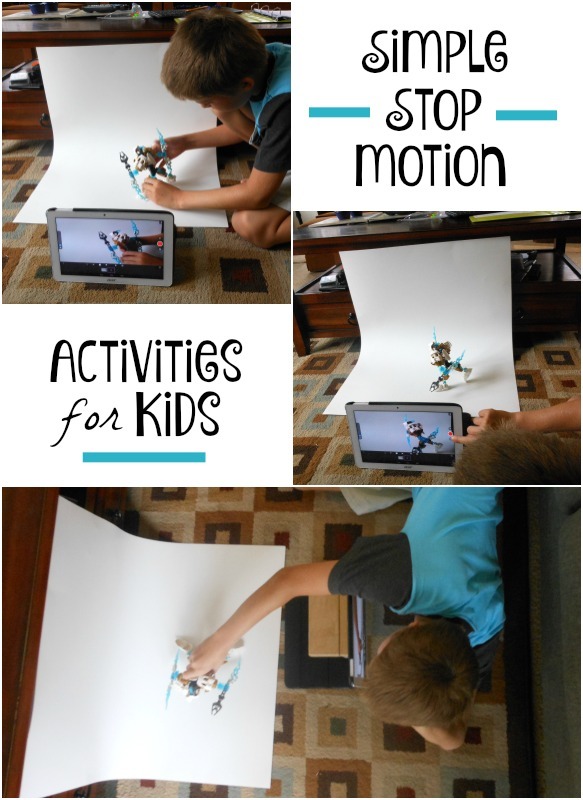 Stop Motion App. There are a lot of stop motion apps. M and M have tried both PicPac Stop Motion & Time-Lapse and Stop Motion Studio. They prefer Stop Motion Studio. 3 desk lamps. We are using natural light for now, but I see an upgrade to artificial lighting in our near future. I like these desk lamp because the flexible neck is perfect for setting up around a stop motion scene. Poster board or foam core. I ran out and bought a few sheets of white poster board. These work pretty good, but they don’t stand well. Our next step will be investing in some foam core . Stop motion kits. OgoBild Animate It Studio Kit is a fun kit that comes with it’s own webcam. This one is recommended for 8 and younger. Minecraft Stop-Motion Animation Studio is perfect for kids who love Minecraft. This one is recommended for kids 6-12. This should be enough to get you started! If you have a favorite stop motion for kids tip or tutorial, share it in the comments. Thanks for all of this information! I’ve been wanting to let my kids do this, but wasn’t sure where to start. So many skills gained and lots of learning while having fun!